TWO incidents involving campus politics in South Africa need some explanation. The first involved the Durban University of Technology (DUT). Last week its SRC chair was calling for all Jews to be deregistered and in particular, those Jews who support Israel. This week, the SRC was issuing a retraction. The announcement was shortly followed by news that members of the University of Cape Town (UCT) students council would be visiting Israel, ostensibly on a fact-finding mission. The predictable anger from the vocal Palestinian lobby on campus looks set to disintegrate into yet another round of name-calling. So far as PSF is concerned, issues in the Middle East should not be debated, Jews must be banned or restricted from holding any opinions not authored by the BDS central committee. It is not surprising then that some of the basic tenets associated with the campaign are falling apart, since BDS appear to be living in a Cold War time warp, cherry-picking UN resolutions to back up their arguments. In 1975 the UN issued the infamous resolution 3379 equating Zionism with racism. After the end of the Cold War, the same UN general assembly issued a resolution reversing the earlier resolution. The earlier 1975 resolution 3379 is the basis for several conferences in South Africa, each one arriving at the conclusion that Zionism is Racism and worse, apartheid. The 1975 resolution is also the basis for a Human Sciences Research Council (HSRC) research paper reiterating its findings. No resolution has ever been issued by the UN for any similar form of ethnic nationalism, for example: Kemalism. 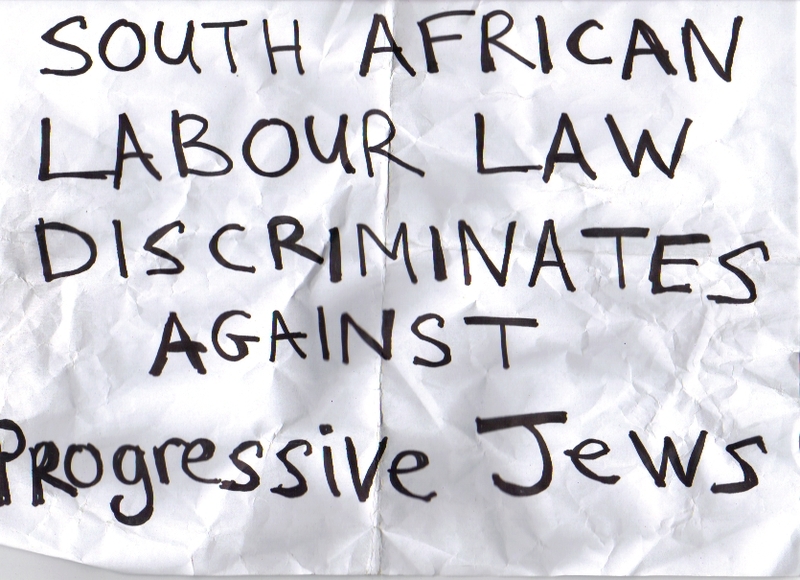 THERE are a number of things which need to be said in regard to the recent action against Reggies, a Jewish-owned business operating in South Africa. Firstly it would appear that children are now being used as political pawns in a war being conducted by adults. Secondly, a boycott of Jewish Toys is ill-considered. It is one thing to tackle an adult beauty product on the basis of a dispute over the borders facing the Dead Sea, but another thing entirely to boycott toys for kids, on the grounds of a businessman’s apparant support of a fund ostensibly being used to plant trees in greater Israel. The Open Shuhada Street Campaign against AHAVA which conducts some of its business in territories occupied by Israel and which are disputed in terms of international law, is most certainly a well thought out action aimed at bringing the territorial dispute to the attention of the general public. Aside from the vigilantism inherent to this type action — there are legal options which have not been fully explored — the case against the JNF has by no means been decided in South Africa. The evidence referred to by Horwitz in his supposed correspondence with Zimmerman, has not been tested and has not received anywhere near the kind of open intellectual inquiry that would be needed to determine whether or not there is any veracity to any of the claims. South Africans have no doubt witnessed similar debates about our local fynbos, in particular the controversy over Cecilia Forest, in Cape Town which has now been cut down and replaced with indigenous trees in a programme that aims to rectify water shortages and some of the supposed excesses of colonialism in Southern Africa. Unfortunately, the problem in Israel has absolutely nothing to do with British colonialism. Underlying the environmental issues, is the controversial issue relating to the recapture of land gained during successive periods of conquest. To make a comparison, an equivalent scenario, would be if a group calling itself the Front for the Return of the Phoenician Empire, were now demanding that all land in the Cederberg be returned to the Phoenicians, since it is clear from historical data, that Phoenicians planted ceders there during their journeys around the African continent. There is a very good reason that people calling themselves “Palestinians” have been removed from Carmel. For starters, the land was gained through acts of colonial conquest, infanticide and outright murder. Where did it all start? With slavery in the land of Egypt and an Egyptian Empire that murdered workers in order to prop up a tyrannical family posing as Gods? Or the Roman Empire which proceeded to destroy the Jewish State through acts of cultural genocide and expulsion? The province of Syria-Palaestina created by Herod following the defeat of the Bar Kokbah Revolt in 135CE was a concoction of the Roman bureaucracy which sought to destroy Judaism, lest its ideas of tolerance and egalitarianism be allowed to overthrow the Empire. In the end, an offshoot of Judaism known as Christianity succeeded where the Maccabees failed. The State of Israel keeps reappearing throughout history. A map of the Kingdom of Israel shows the state on both sides of the Jordan River. This state was replaced by the Crusader Kingdom, which was destroyed by the Ottomans and then regained during World War 1. After the genocide of six million Jews during World War 11 and the murder of 100 000 Jerusalem Jews by the Ottomans, demands for the return of Israel to the Jewish people became hard to deny. Despite the Balfour Declaration and attempts by politicians to carve up the land of the British Mandate of Palestine into unequal pieces, with the vast majority of land being given to the Jordanian-Palestinians, the State of Israel was eventually regained by the Jews though a war of Independence. It is this war which Horwitz seeks to undo, in his ill-considered attempt to repatriate property to an illegitimate entity which seeks to destroy the Zionist State by replacing the narrative of Jewish Independence, with an Hamasist fable that ignores the existence of Jordan and other Palestinian entities. He could do a lot better by simply demanding that Jews and Arabs receive equal treatment in a new dispensation which puts an end to the strife between Palestinian and Jew, and which seeks reconciliation in a new entity based upon fundamental human rights. Furthermore, there is no reason why Palestinians, under the current system should not be treated equally either as Israelis, or receive citizenship as Jordanians, in the land given to them by the British Empire. UPDATE: An article carried by the M&G now refers to the judeafication of the Negev Desert, as if Jews do not have any right to the land granted in terms of UN Resolution 242. Whatever ones feelings about the plight of the Bedouin, who are now threatened by housing projects, the fact remains that Arabs already have over 75% of the British Mandate of Palestine. This fact is conveniently omitted in the propaganda war, which seeks the delegitimization of the State of Israel, on the basis of previous Empires acquisition of property via acts of conquest, as well as the removal of Jewish rights in the diaspora. Such conquests are specifically outlawed under international law, and is the basis for the dispute over the West Bank, Golan Heights and East Jerusalem. NOTE: Lewis is an anarchist and progressive Jew, he does not support the state, but rather the idea of universal human rights. He is thus opposed to any dispensation which lacks a Freedom Charter. He wishes to express his outrage at having to reiterate common knowledge merely in order to demonstrate why statism on either side is bound to fail. Yesterday I picketed the Russel Tribunal on Palestine. I wish to remind readers that my views on the Israel-Palestine issue are well known. As an anarchist, I have been highly critical of the Zionist State and have attended many Pro-Palestinian events, including Stop the War, Ashley Kriel Memorial Lecture, the Sministim Tour and a host of local debates on the subject. Earlier this year I gave a seminar at the IDASA Democracy Centre on the environmental dimension of the Middle East problem. I am also on record in my opposition to the separation barrier and, just happen to be one of those activists present at the formation of the Open Shuhada Street campaign. (Although Nathan Geffen will probably balk at any suggestion the campaign was a continuation of the Anti War Coalition, programme). Having said this, I am extremely concerned about the way support for freedom is taken as carte blanche support for ‘by any means necessary’ — and what is now turning into predictable violence emanating from the Palestinian quarter (as well as the religious right). Then there is the issue of the abuse of the historical record in South Africa, in particular the denigration and obliteration of the memory of the victims and survivors of the apartheid system.